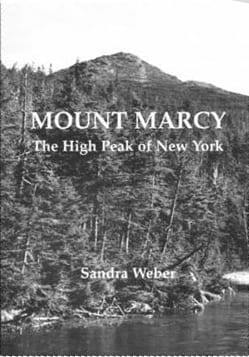 Four hikers pay tribute to an Adirondack legend while climbing the peak newly renamed in her honor. Relaxing after a tough climb, Susan Bibeau admires the view from Grace Peak. Shortly after moving to the Adirondacks in 1996, I climbed Giant Mountain. Not only was it my first High Peak, it was the first time I’d climbed anything higher than the hill in the back yard where I grew up. While incredibly rewarding, the hike was harder than I had imagined even though I was a fit, thirty-year-old marathon runner. It was humbling. Nevertheless, like many others before me, I was hooked on the Adirondack Mountains, and I wanted more. That same year Grace Leach Hudowalski celebrated her ninetieth birthday, an occasion covered in the local papers. I’d never heard of Grace or the Adirondack Forty-Sixers, but I was smitten by the photo of her beaming with her birthday cake, proudly sporting her Forty-Sixer patch. 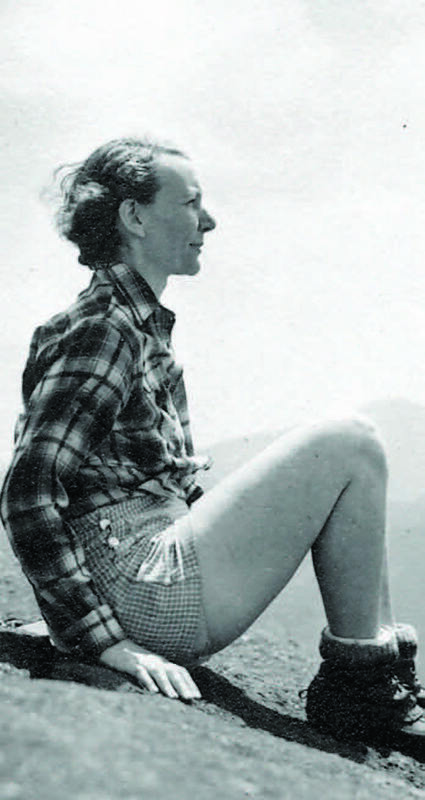 I did some reading and learned that in 1937, at thirty one- years old, Grace became the first woman and (ninth person overall) to summit all forty-six of the High Peaks. The last on her list was Esther Mountain, then the only one named after a woman. The thought of this sweet little lady, the same age as my grandmother, having been the first to complete such a feat during an era when women were not encouraged to pursue outdoor activities, let alone those of physical endurance, was awe inspiring. I became an instant fan. 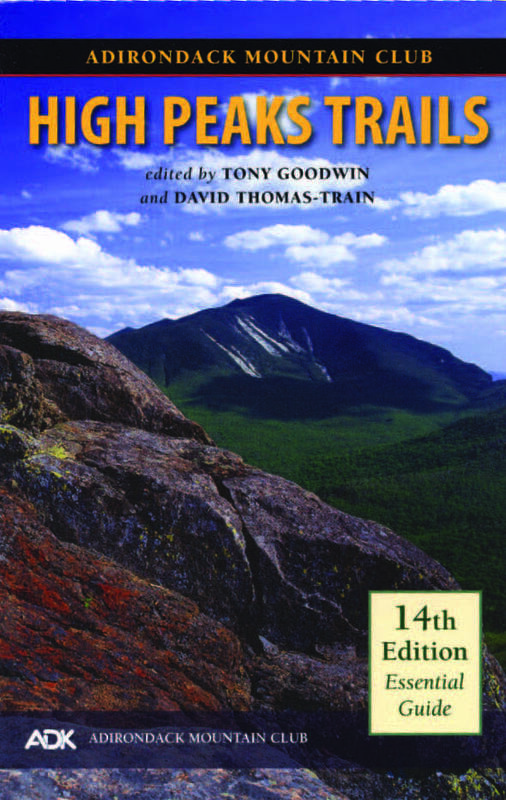 So I was elated this past June when the U.S. Board on Geographic Names granted the petition of the Forty- Sixers organization (made up of hikers who have climbed all the High Peaks), after years of lobbying, to change the name of East Dix to Grace Peak in her honor. And what better way to pay tribute to my longtime hero than to climb the mountain now named after her? I couldn’t wait. In July, I rounded up three friends— Kathleen Wiley, photographer Lisa Godfrey, and Jaime Armstrong (who brought her dog Chloe)—and we set out for Grace’s summit. It seemed fitting that this should be an all-girls outing. 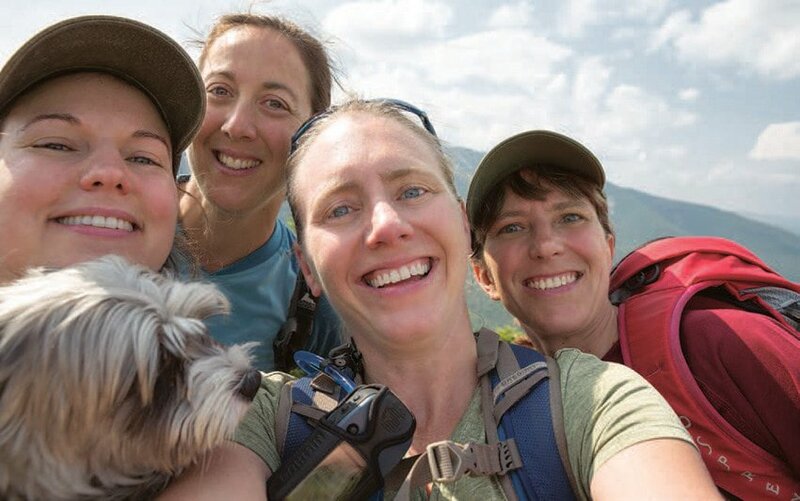 Chloe, Jaime, Sue, Lisa, and Kathleen take a group selfie on the summit. 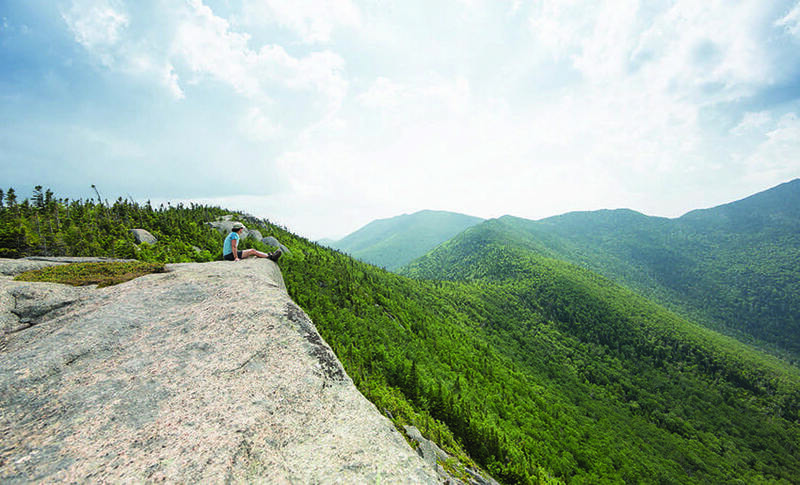 At 4,012 feet, Grace is the forty-second-highest peak in the Adirondacks. It’s part of the Dix Range, which also includes South Dix, Macomb Mountain, Hough Peak, and Dix Mountain. 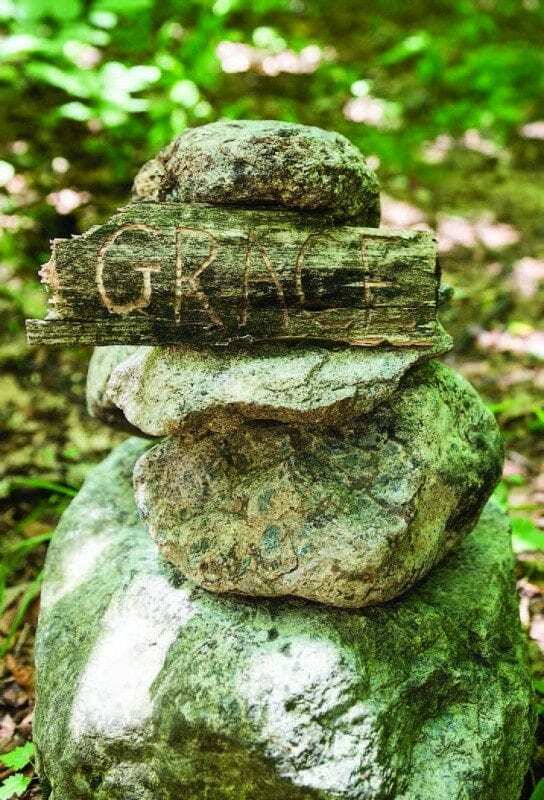 There are several routes into the range, but the most popular if hiking Grace Peak by itself starts just off of Route 73, roughly seven miles from the hamlet of Keene Valley. 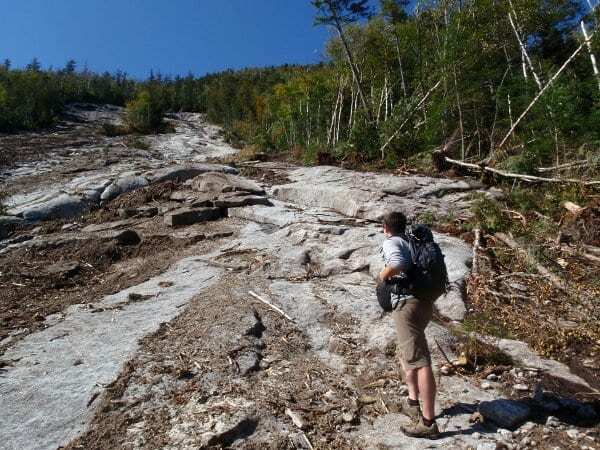 This approach follows first the North Fork and later the South Fork of the Boquet River to the base of a slide that rises to the summit. 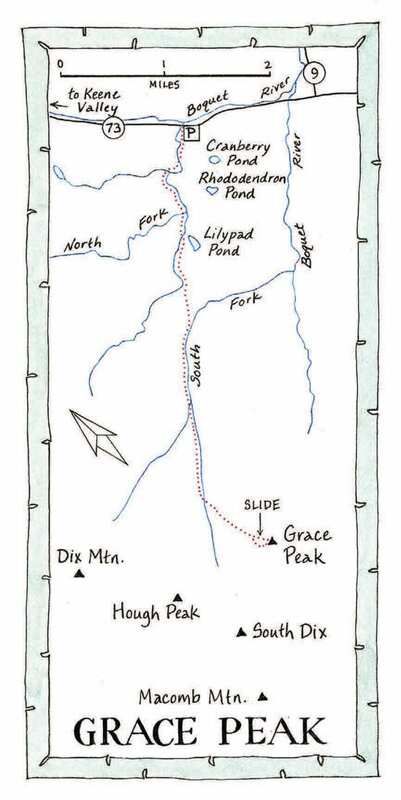 Although the trail is unmarked, it’s fairly easy to follow to the slide, as long as you make all the right turns. The first challenge is finding the crossing— a rock hop—from the south side of the North Fork to the north side. It’s about a third of a mile up the trail. Look for a cairn and on the opposite bank the continuation of the trail. (You must be vigilant so you don’t follow the southside trail beyond the crossing.) After the crossing, the trail hugs the bank above the river for a mile or so before descending to cross the North Fork again. 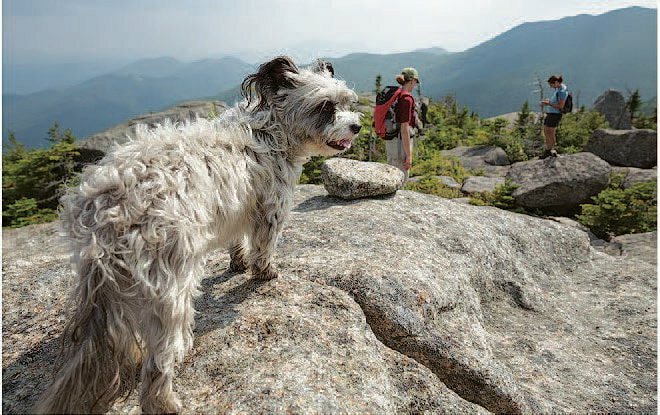 A cairn helps keep hikers on route. Between the two crossings, I notice some beautiful purple flowers that I’ve never seen. I love identifying flora and fauna that I encounter, and today I am in luck. Kathleen is the associate director of the Watershed Stewards Program at Paul Smith’s College and Jaime is a middle-school science teacher. They know their plants. “What are those called, Kath?” I ask. “Those are bottle gentians,” she tells me. Jaime points out a plant called groundcedar or crowsfoot. “It’s actually a type of clubmoss,” she adds before explaining how the plant disperses its spores. Moving on, we pass a beaver meadow and, at 1.8 miles, come to a small clearing with a filtered view of the Dix Mountain ridge. The woods are quiet as we leave the rushing North Fork behind. Suddenly we hear an ovenbird’s call: teacher-teacher-teacher. “I think he’s calling you Jaime,” I say. After a short descent, the trail winds around a beaver pond, where we linger a bit. Kathleen identifies a few more plants, jewelweed and Clintonia. The latter is also called blue-bead lily. “The berries are very toxic,” Kathleen warns. The trail leads us down a bank to the South Fork. The stream here is shallow and fairly narrow. Sunlight filters through the tree canopy and falls on idyllic pools and small flumes among the boulders. The path winds back and forth across the stream, with the way marked by cairns of various sizes. Lisa stops to take a photo of a huge bright-orange mushroom. “What type is that?” I ask Jaime. “I don’t know my mushrooms,” she replies. Eventually, we find ourselves climbing steeply along the South Fork. I take a look at my GPS app to see how much farther we have to go to reach the slide. 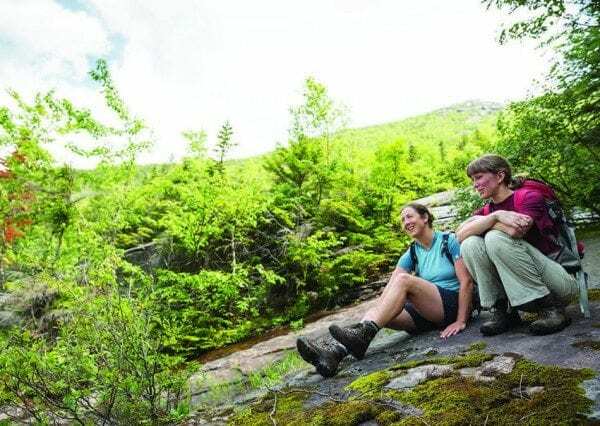 Sue Bibeau and Kathleen Wiley take a break at the base of the slide. “Well, the good news is the summit is only about a mile away,” I say. “Let me guess, there’s some climbing involved?” Lisa responds. In another quarter-mile we spy the slide through the trees. We could avoid the slide by continuing on the trail to the ridge between Grace Peak and South Dix, but we all agree that the slide will be more adventurous. If it’s wet and slippery or if anyone feels uneasy, we can always bail out and return to the trail. At first, the slide is not particularly steep. As we make our way upward, we stop every so often to look behind us at the view. Ahead we can see the rocky summit; it looks deceptively close. I wonder out loud if Grace ever climbed this slide. The higher we go, the more the view opens up. Dix looms directly behind us, with Hough to the left. The slide also begins to get steeper. Chloe seems intimidated, and Jaime is having a hard time directing her up the rock. Lisa and I head Jaime’s way, and the three of us pass Chloe from one to another up the slide. Thankfully, she only weighs about fifteen pounds. After a well-deserved nap on the summit, Chloe is ready to head home. I begin to have second thoughts about climbing the slide—not for myself but for leading my friends into a potentially precarious situation. Of the four of us, Jaime has the least experience with this kind of climbing. She’s not freaking out, but I know her well enough to realize she’s uneasy. “If I stay calm, she’ll stay calm,” I tell myself. I position myself below her, and we talk through each placement of hands and feet. “You’re tough, Jaime, you got this,” I say. “Yeah, but my legs are short!” Her sense of humor is reassuring. Lisa is now ahead of us and seems to be climbing with confidence. “How are you doing? Are you OK?” I yell up. “We’re good!” I shout back. The slide’s headwall looks scary steep, but we can see a narrow chimney that looks to have promising holds. However, a dense thicket separates us from it. Lisa tries to find a way through, but the impenetrable krummholz stops her dead. Meanwhile, Kathleen, who evidently is part mountain goat, has been scouting above us. 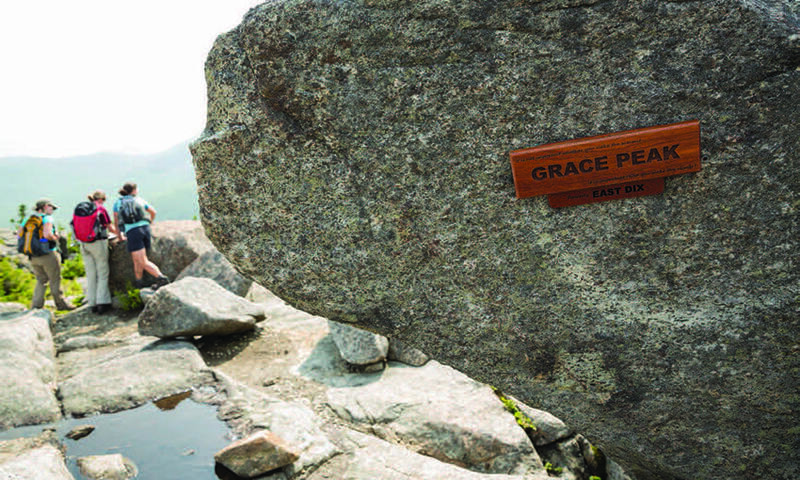 Admirers of Grace Hudowalski placed this commemorative sign on the summit. “Found a path!” she yells. “You rock, Kath!” I yell back. Once through the bushes, we have a short, steep climb up the headwall to the open ridge. Once we make it, I give each of my friends a big hug. We had come more than five miles. “Good job, team!” I say to my hiking buddies. I beg forgiveness for leading us into danger, but everyone is in good spirits. The view is a spectacular payoff for our hard work. All of the Dix Range is stretched before us. Among the scores of other peaks, we pick out Noonmark, Haystack, Giant, and, in the distance, Whiteface. It’s dizzying to look down the slide we just ascended. Lisa asks me to stand close to the edge for a photo, but I have to sit down. “I’m afraid of heights.” I admit. “Seriously?” She laughs at me. We spend almost an hour soaking in the sun, eating, chatting, and looking at the map. Chloe finds a shady spot and takes a well-deserved nap. When it’s time to go, we walk south a short distance to the true summit, from where we will descend by trail to avoid a tricky climb down the slide. We pose while Lisa snaps some shots. We all reflect quietly for a bit. 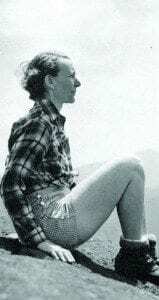 I’m filled with gratitude for all of the women like Grace Hudowalski who paved the way for the rest of us. I’m also grateful to be sharing this day with such a fine group of ladies. “I’ll bet Grace would be proud,” I offer. “I’ll bet she would.” Jaime says. DIRECTIONS: The trailhead is on the west side of Route 73, just south of the North Fork of the Boquet River. The North Fork flows under a stone bridge about 1.5 miles north of the junction of Route 73 and Route 9. The dirt road leading in to the trailhead is washed out. Unless you have a vehicle with high clearance, plan to Park along Route 73.